With a preliminary ruling that Bombardier’s CSeries sale to Delta Air Lines last year was supported by subsidies from the governments of Canada and the U.K., Commerce slapped a massive tariff of 219 percent on every CSeries airplane that’s sold to a U.S. airline – more than tripling the price. The ruling threatens to spark a trade war with Canada, where the aircraft is assembled in Montreal, Quebec. It will also draw in the British government because the CSeries wings are built in Belfast, Northern Ireland. The decision won’t be final until validated by further rulings of the U.S. International Trade Commission. The process is expected to close in February. That’s about a month before the first CSeries jet coming into the U.S. market is due to be delivered to Delta Air Lines. Commerce must rule next month on whether the pricing Bombardier offered Delta in its sale of 75 CSeries jets was so low it constitutes price dumping – a decision that could potentially add further tariffs. After that, the ITC must assess if there is “injury” to Boeing and finalize the size of the tariffs. If Tuesday’s ruling stands at the end of the process, it has the potential to wreck the sale to Delta. The purchase of the jets won’t make economic sense for the airline with a price markup of 219 percent, or even higher after next month’s ruling. It could also kill further CSeries sales in the U.S.
Over the weekend, JetBlue chief executive Robin Hayes wrote a letter supporting Bombardier to the ITC, saying that his airline – which currently flies only Airbus and Embraer aircraft, with no Boeing or Bombardier planes in its fleet – is potentially interested in buying the CSeries, but couldn’t do so if Boeing succeeds in adding tariffs to the price. “JetBlue will lose access to a competitive and innovative platform that could bring significant benefits to the American flying public,” Hayes wrote. Bombardier claims that half the content of each CSeries jet comes from U.S. suppliers, which means multiple American companies are uneasy about Boeing’s challenge. Rockwell Collins and Honeywell are key suppliers of avionics to the CSeries. Pratt & Whitney, a unit of United Technolgies headquartered in East Hartford, Conn., supplies the CSeries geared turbofan engines. Both of Connecticut’s U.S. Senators wrote letters supporting Bombardier to the ITC. Getting around the tariffs?Canada’s government has already indicated that it won’t just roll over and accept a Boeing win. Prime Minister Justin Trudeau said last week that the all-but-completed $5.2 billion deal to buy 18 Boeing F/A-18 Super Hornet jet fighters and related U.S. military hardware is on hold. “We won’t do business with a company that’s busy trying to sue us and put our aerospace workers out of business,” Trudeau said. 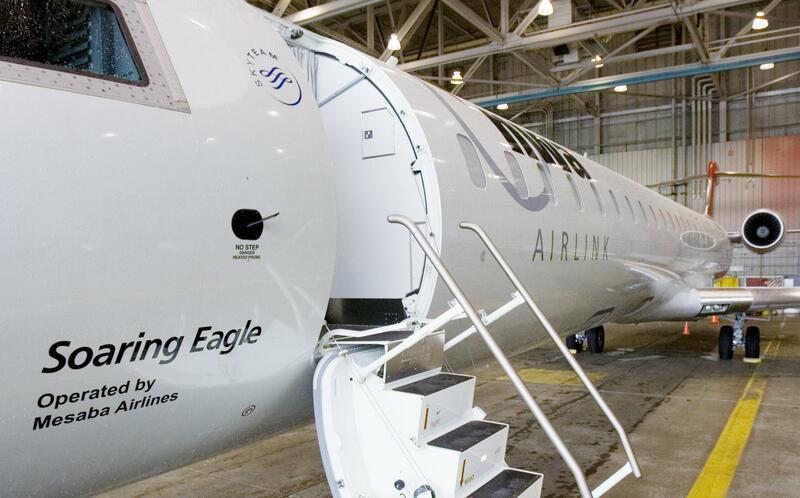 In an interview before the decision was announced Mike Nadolski, Bombardier’s vice president of communications, said the Montreal-based planemaker has been weighing contingency plans in the event of the Commerce decision going against it. While Nadolski declined to disclose what those contingency plans are, some analysts have suggested one possible approach: Bombardier could move to protect its customers by having one of its U.S. subsidiaries be the formal importer of any CSeries aircraft – and so having that subsidiary pay the tariff before passing the jet on to the U.S. airline. That’s a way of preserving the sales momentum the CSeries finally garnered with the Delta order last year. However, it would be expensive and risky for Bombardier. It makes sense only with the assumption that an adverse ruling will be reversed upon appeal and the tariffs reimbursed. Appeals will inevitably be slower than the fast-track ITC procedure. Bombardier may appeal initially to the U.S. Court of International Trade in New York, then to the Court of Appeals and potentially even the U.S. Supreme Court. Beyond that, it must take its case to an international forum. The Canadian government could appeal to a dispute panel of the North American Free Trade Agreement and then to the World Trade Organization. But international arbitration of such trade disputes typically plays out over many years. In the meantime, the tariffs will apply to all U.S. sales, like millstones hanging from the wings of the CSeries. Published: Sept. 26, 2017, 4:19 p.m. Updated: Sept. 26, 2017, 5:16 p.m.